Hot rice flan mixed with pork and mushroom and served with fish sauce, banh duc nong makes the perfect winter snacks. In the 16 best breads in the world, Vietnam bread is different? Familiar to Hanoians, and often street peddlers, snacks such as banh duc or plain rice flan, che con ong or hard caramel flavored ginger sticky rice disc, che dau xanh or mung bean and banh tro are found across the capital. Known as quà quê or countryside traditional cakes, these snacks used to be signatory dishes representing celebrations like lunar New Year, or festive family gatherings. Nowadays, they have become equavilent of fast food. Among these so-called countryside snacks, banh duc is the one that made from simplest ingredient – sticky rice and peanuts. Vietnam’s famous writer, Vu Bang, one of 3 guru of Hanoi cuisine described banh duc in his “Hanoi culinary book” as the tender, rustic and mild taste, also, the hidden elegance fragile beauty rather than rebellious one. And the way it was served represented Hanoi culinary quintessence. It seems to be traditional perception that Banh duc is paired with Tuong ban or tofu. Or Nom banh duc or banh duc salad with banana’s baby flowers is ideal fresh snack in summer. With these traditional and special ways of serving banh duc, busy modern people may feel that banh duc is something time-expensive for them. Imagine, it’s like when you love Vietnam’s drift coffee, but you have no choice but to accept instant take-away. Or you are so in love with home-made pho, but your busy schedule only allows you for an instant noodle. In this case of banh duc, you can’t carefully prepare tuong ban or any pairings, and within 10 minutes, you still want to enjoy rustic but delicious banh duc in this season of the year? The answer is hot banh duc or banh duc nong. So is banh duc nong the same but a modern and instant version of traditional banh duc? How does it taste? It is a totally different from cooled banh duc with tuong ban. While the cooled version is jelly-shaped, banh duc nong is a hot bowl of watery banh duc topped with minced pork, wood ear mushroom, fried onions and herbs with fish sauce. Due to its added ingredients, people also call it banh duc thit. To some elderly Hanoians, they may feel unfamiliar. But for young people, this is a very good treat in winter. “A hot bowl of banh duc thit under this weather really warms diners up. I don’t know who is the person who initiated this idea of making hot watery banh duc with pork meat broth. However, I have sold banh duc thit in this small market for more than 10 years and both old and young Hanoians really love it” the lady at Banh Duc Dac Biet eatery at C4 Trung Tu area, 46C Pham Ngoc Thanh alley said. “I don’t have secret recipe or any formula. 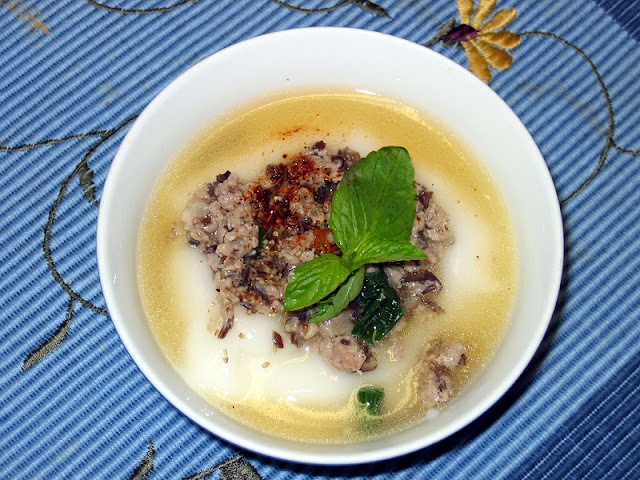 I just adapt from the way traditional people made banh beo or water fern cake and banh gio or pyramid rice dumpling. If you notice, banh duc nong is poured with fish sauce like the way banh beo is served. But instead of the original fish sauce, this is a mixture of fish sauce with minced pork and mushroom. Look at perfect combination of the rice cover with the core made from minced pork and mushroom, you would simply understand why hot banh duc is perfect when paired with these ingredients” she continued. “Banh duc is not a complicated dish, but it requires the experiences of the people who cook it. It is simply made from sticky rice, however, many home-cooks fail as their banh duc taste bitter. The timing and fire for cooking hot banh duc is totally different from cooled one. My banh duc is kept hot all day long, but no time does it taste bitter or being burnt”. “ Varied from the original version, banh duc nong also has its own way of enjoying. My advice is diners should not eat more than 1 bowl. As it is a snack, it should be light and make you want to eat it next time”. To me, as a fan of traditional cuisine, I always think of Vu Bang’s saying about banh duc. As a traditional and fragile beauty, diners can only feel its hidden beauty once it is served in right context. It would be nothing if you enjoy banh duc nong in restaurant with beautiful lights and air-con. Just enjoying it under the bitter of winter and feeling the warmth embracing you. Join the Hanoi City Tour and experience the diverse cuisine and culture in the capital of Vietnam - S-shaped country.